NAND flash memory has surpassed hard disk drive (HDD) technology in areal density for the first time, according to a new report from a market research firm. 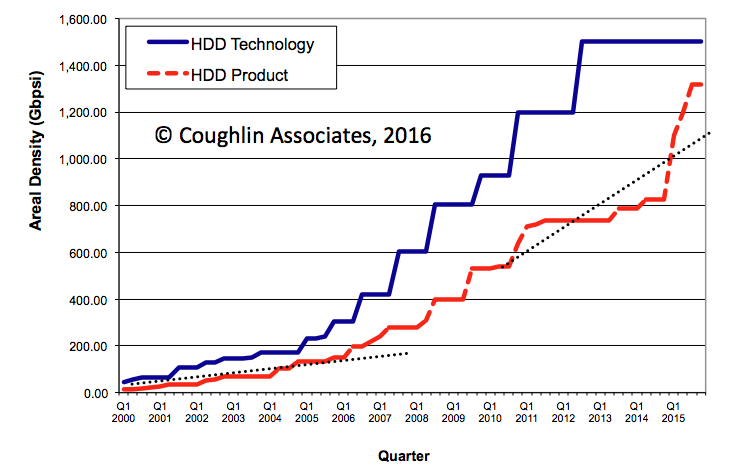 During a presentation at the 2016 IEEE International Solid State Circuits Conference (ISSCC) in San Francisco last week, Micron shared data showing NAND flash has moved past HDDs in areal density, according to Coughlin Associates. At last year's ISSCC, Samsung white papers indicated that its 3D NAND flash products had reached 1.19Tbits per square inch (Tbpsi) and said in 2016 they would reach 1.69Tbpsi. This year, Micron revealed it had demonstrated areal densities in its laboratories of up to 2.77Tbpsi for its 3D NAND. That compares with the densest HDDs of about 1.3Tbpsi. Tom Coughlin, Coughlin Associates president, noted the flash advancements in a column in Forbes.com last week. The announced hard drive products from the third quarter of 2014 to the third quarter of 2015 had an increased areal density of about 60%, So HDDs have not stopped evolving," Coughlin said. "On the other hand, flash memory is getting denser with technology announcements of 2.77Tbspi, higher than any announced HDD areal density. This is a new development. So flash is developing and certainly getting competitive in terms of areal storage density, but the chips are still more expensive to make than disks and the raw costs of storage will likely remain less for HDDs for some time to come." 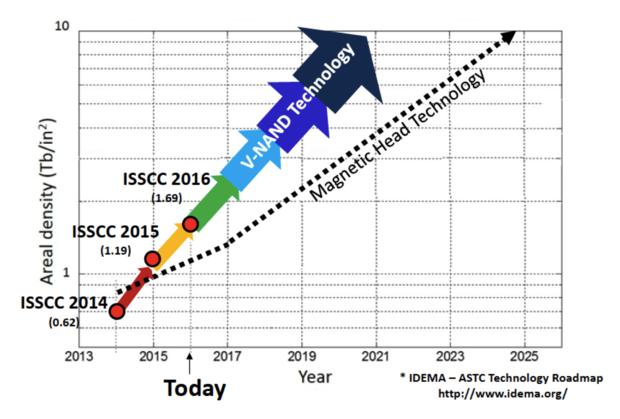 During its presentation this week at ISSCC, Samsung representatives referenced an Advanced Storage Technology Consortium graphic that projected HDD areal density out to the years 2025. Samsung superimposed its own timeline on the graphic, and said that in 2015 NAND flash had already surpassed magnetic head storage technology (HDD and magnetic tape drives) in areal density. The highest areal density for today's HDD products is about 1.3Tbpsi, according to Coughlin. Most HDD products, however, are well below that. For example, Seagate's desktop hard drives have a maximum areal density of 850Gbpsi; those drives use shingled magnetic recording (SMR), which overlaps the magnetic tracks for greater density. While still best-case laboratory figures, the NAND flash areal densities shown at the ISSCC are not far behind what is shipping today. Major SSD makers, such as Samsung, have announced what would be industry-leading 15TB 2.5-in solid-state drives (SSDs) are already on the horizon. Tokyo-based Fixstars is selling a 13TB, 2.5-in SSD that will be selling for $1 per gigabyte -- or $13,000. By comparison, an 8TB helium filled hard drive can be purchased for as little as $515. During its presentation this week at ISSCC, Samsung representatives referenced an Advanced Storage Technology Consortium graphic that projected HDD areal density out to the year 2025. Samsung superimposed its own timeline on the graphic, and said that in 2015 NAND flash had already surpassed magnetic head storage technology (HDD and magnetic tape drives) in areal density. HDD products continue to increase in areal density. The highest HDD technology demonstrations date from 2012 at about 1.5 terabits per square inch (Tbpsi). HDD areal densities today in shipping products, however, are only as high as 1.3Tbpsi. "That doesn't mean that the price is going to reach parity with hard drives because the factories to build flash are still a lot more expensive to build than the hard drive factories -- especially the 3D NAND; it's something like a $10 billion plant," Coughlin said. Because of 3D NAND's greater density, manufacturers such as Micron and Intel are opening new plants or are revamping older NAND facilities to increase their 3D production, which is driving prices down. According to a recent report by DRAMeXchange, a division of market research firm TrendForce, the plummeting prices of SSDs have also driven their recent adoption in laptops. This year, SSDs will be used in around one-quarter of laptops. Next year, SSDs are expected to be in 31% of new consumer laptops, and by 2017 they'll be in 41%, according to DRAMeXchange senior manager Alan Chen. HGST's 8TB Ultrastar HE8 helium-filled hard drive has areal density of just 664Gbpsi. While SSD pricing has dropped dramatically over the past three years, HDD pricing hasn't. From 2012 to 2015, per-gigabyte pricing for HDDs dropped just one cent per year -- from 9 cents in 2012 to 6 cents this year. However, through 2017, the per-gigabyte price of HDDs is expected to remain flat at 6 cents per gigabyte. In 2013, Samsung became the first semiconductor manufacturer to begin producing 3D NAND. Its V-NAND chip provided two to 10 times higher reliability and twice the write performance of planar (single-layer) NAND products, the company claimed at the time. Samsung's V-NAND uses a cell structure based on 3D Charge Trap Flash (CTF) technology that allows V-NAND to provide more than twice the scaling of today's 20nm-class planar NAND flash. Last year, SanDisk and Toshiba announced they had begun manufacturing 256Gbit (32GB), 3-bit-per-cell, 48-layer, 3D NAND flash chips that offer twice the capacity of the next densest memory. Coughlin believes 3D NAND products will reach price parity with the more common planar NAND by 2017. But he's skeptical that any type of NAND flash will reach parity with HDDs anytime in the near future. "It's possible, but that requires hard-drive makers to quit trying to increase their capacity," Coughlin said. "They're still putting R&D dollars into shingled and two dimentional magnetic recording. So I don't think all the magnetic storage industry's tricks are out of the bag yet." For example, Seagate's CTO Mark Re said in an interview with Computerworld in November 2014 that his company plans to begin using heat-assisted magnetic recording (HAMR). This technology uses a laser to help stabilize bits written to a platter, and will increase density by as much as 40%. Using HAMR, the theoretical density for hard drives skyrockets, affording a 3.5-in server or desktop drive up to 60TB and a single-platter, 2.5-in. laptop drive up to 20TB of capacity. Seagate has already demonstrated HDDs using HAMR with areal densities of 1.4Tbpsi, Re said. The company plans by next year to be "working with a select partner or two to demonstrate a product in a data center application, and in 2018 you'll see HAMR technology used more broadly in the field," Re said.